The musical soundtrack to the film, "America the Beautiful", the Circle Vision 360 film that used to be at Disneyland from the late sixties til the early eighties, can be found on this fantastic album from Disney: "A Musical History of Disneyland". This music, typical of music in any Disney venture, really can set some atmosphere. I'm listening to this music as I type this now! The music is from regions all over the United States. If you've seen this movie a zillion times, like I did when I was a teenager, you can't help but have visions of what's going on as you listen to it. This particular track in the set is almost 18 minutes long! 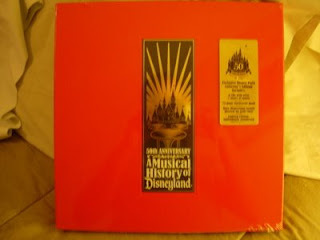 This music set is one of the best that I have in my fantastic, magical collection of Disneyana!